World Trade Center Physics Mailer 25-Pack World Trade Center Physics Mailer 100-Pack Newspaper 100-Pack "9/11 Investigator"
5 of the 2" x 8" stickers which say "9/11: Examine the Evidence". 10 of the 2" x 8" stickers which say "9/11: Examine the Evidence". 20 of the 2" x 8" stickers which say "9/11: Examine the Evidence". 2 of these 4" x 15" bumper stickers which say "9/11: Explosive Evidence". 10 of these 4" x 15" bumper stickers which say "9/11: Explosive Evidence". 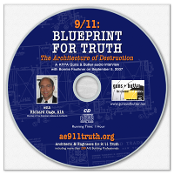 9/11: Blueprint For Truth Companion Ed. and 9/11: Experts Speak Out combo. 10-PACK. NEW DVD! 9/11: Explosive Evidence - Experts Speak Out in pesentation case. 25-PACK. NEW DVD! 9/11: Explosive Evidence - Experts Speak Out in presentation case. This is the powerful documentary film by Architects & Engineers for 9/11 Truth in a special cardboard sleeve for the ReThink 911 campaign. The powerful documentary film by Architects & Engineers for 9/11 Truth is now available in 18 languages (subtitled). Blueprint For Truth 2-DVD set: Both the full two-hour research edition and the companion edition, each in presentation cases. 10-PACK. 9/11: Blueprint for Truth – The Architecture of Destruction — Research Edition DVD. Two-hour presentation. Updated from earlier editions. 25-PACK. 9/11: Blueprint for Truth – The Architecture of Destruction — Research Edition DVD. Two-hour presentation. Updated from earlier editions. DVD in cardboard sleeve. 9/11: Blueprint for Truth – The Architecture of Destruction — Research Edition. Two-hour presentation. Updated edition. 10-PACK. 9/11: Blueprint For Truth – The Architecture of Destruction — Companion Edition DVD with 10-, 30-, and 60-minute abridged versions and bonus material. 25-PACK. 9/11: Blueprint For Truth – The Architecture of Destruction — Companion Edition DVD with 10-, 30-, and 60-minute abridged versions and bonus material. DVD in paper sleeve. 9/11: Blueprint for Truth – The Architecture of Destruction — Companion Edition DVD with 10-, 30-, and 60-minute abridged versions and bonus material. Six language European Companion Edition of 9/11: Blueprint for Truth that offers AE911Truth's groundbreaking presentation on the WTC skyscraper demolitions - complete with voice-overs. Six language European Companion Edition of 9/11: Blueprint for Truth that offers AE911Truth's groundbreaking presentation on the 3 WTC skyscraper demolitions - complete with voice-overs. AE911Truth's creative educational documentary on the destruction of Building 7 on 9/11/01. Packaged in a printed cardboard sleeve for the ReThink911 campaign. 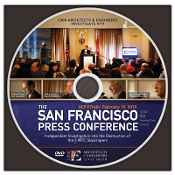 KPFA radio host Bonnie Faulkner interviews Richard Gage, AIA on the physical evidence that makes the official story undergo total progressive collapse. This is the ultimate ReThink911 tool kit on your activist belt. A $289 value designed for serious activists. Save 15% off our already discounted bulk pricing! All the gear you need to bring a friend along for some serious street action! Here's all you need to hit the streets on your own and educate your community! 500 PACK - What You Are Not Being Told About 9/11. 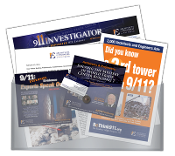 Beautiful four-panel glossy brochure concisely lists some of the most important facts about 9/11. 1000 PACK - What You Are Not Being Told About 9/11. 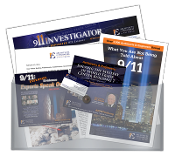 Beautiful four-panel glossy brochure concisely lists some of the most important facts about 9/11. 500 PACK - We have repackaged our standard street brochure for ReThink911 September 2013! 1000 PACK - We have repackaged our standard street brochure for ReThink911 September 2013! 50-PACK. A pack of cards that each list points of evidence about World Trade Center 7, the third building to come down in seconds on 9/11. 100-PACK. A pack of cards that each list points of evidence about World Trade Center 7, the third building to come down in seconds on 9/11. 50-PACK. A pack of cards that list points of evidence about the cause of the destruction of the Twin Towers on 9/11. 100-PACK. A pack of cards that list points of evidence about the cause of the destruction of the Twin Towers on 9/11. 50-PACK. A pack of Key Map cards that could make science fashionable again with irrefutable evidence of the controlled demolition of each of the three WTC high-rise skyscrapers on 9/11. 100-PACK. A pack of Key Map cards that could make science fashionable again with irrefutable evidence of the controlled demolition of each of the three WTC high-rise skyscrapers on 9/11. 50-PACK. Mailable postcards that list facts about World Trade Center 7, the third building to come down in seconds on 9/11. 100-PACK. Mailable postcards that list facts about World Trade Center 7, the third building to come down in seconds on 9/11. This is the set of literature we gave to every member of the Senate and House. This is the most concise set of 9/11 truth literature and DVDs out there. Three AE911Truth DVDs and a DRG book available together at discounted price. Three David Ray Griffin Books available together at a discounted price. Get Bundles #1 & #2 together for a 30% Discount! Beyond Misinformation with the powerful AE911Truth documentary “Experts Speak Out".